When I decided this morning I was going to make dinner tonight after work, I thought ahead and took the chicken out of the freezer! I rarely think ahead when it comes to dinner, and I end up defrosting meats in the microwave because I'm impatient. The "chicken" was in a blue grocery bag, and I simply took the bag out, put it in a bowl, and left it in the fridge to defrost. 1. Start by seasoning your sliced chicken breasts with salt and pepper. 2. Using three bowls, start by adding your flour to the first bowl, egg wash (2 eggs + water) to the second, and the breadcrumb, Parmesan, parsley, garlic powder, salt and pepper to the third bowl, incorporating all ingredients well. 3. Take the chicken cutlet and coat with flour. Then, dip in the egg wash, and then the breadcrumb mixture. 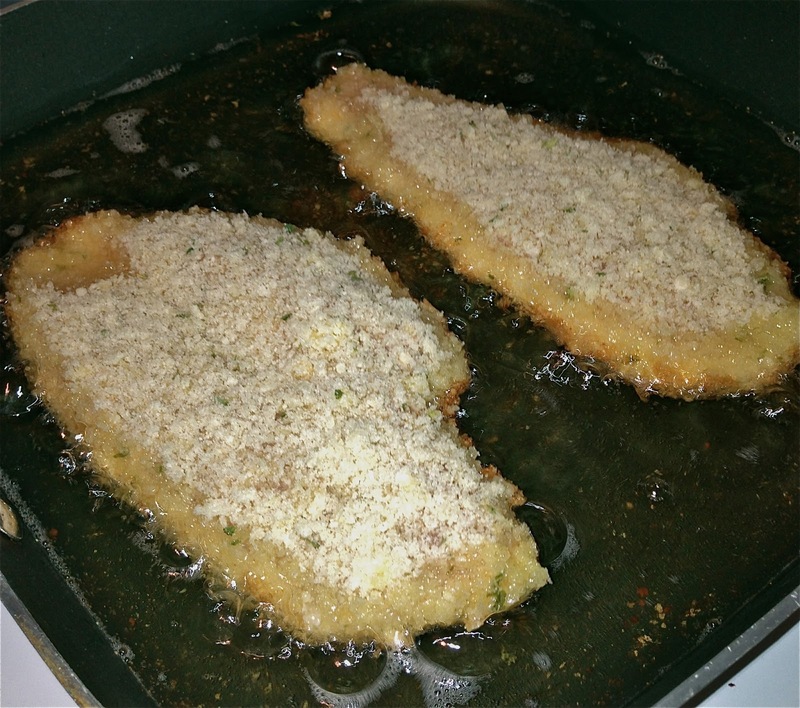 Coat the chicken well with the breadcrumbs, patting down hard and making sure they stick all around! (Sidebar, again! When I was a little kid, and my mom used to make chicken cutlets, I used to pull up a chair, really close to the counter, and say, "Mommy, can I pat?" I guess that was the start of my culinary love!) Set finished cutlets on a baking sheet and stick in the refrigerator to chill out. 4. While your chicken is chilling (which will help the breadcrumb stick while cooking), prepare your pan. Pour the 2 cups of vegetable oil in a skillet and heat until there are ripples through the oil. 5. When the oil is ready, add your cutlets to the pan, two at a time, ensuring you don't crowd the pan and bring the temperature down too much, too fast. 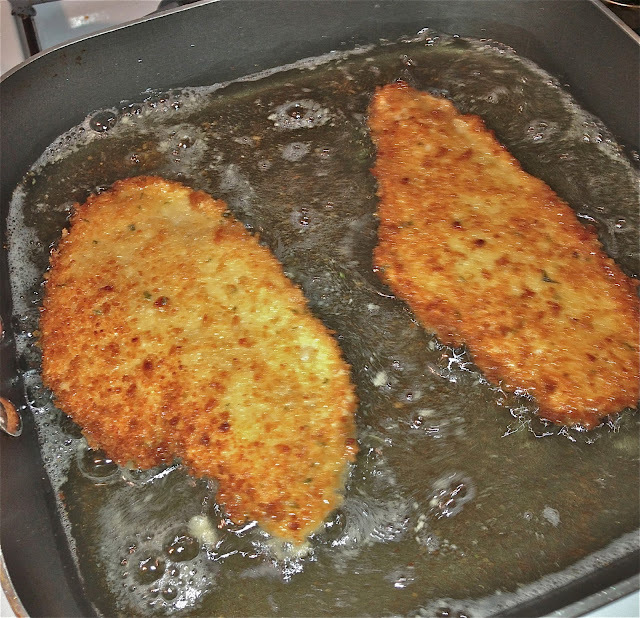 Your cutlets will almost "stick" to the pan until they are ready to be flipped, so don't get too impatient. They basically tell you when they're ready. You'll see the sides browning and crisping. Blurry, but could they have browned any nicer?? 6. After all the chicken cutlets have been browned and cooked through, whisk the melted butter and Frank's buffalo sauce together in a large bowl. Put the chicken in the bowl, and coat generously with buffalo sauce. 7. Cover each cutlet with two slices of pepper jack cheese, and broil on high until the cheese is bubbly and melted. By putting the chicken back in oven, the sauce will also start to caramelize - YUM! 8. Brown your rolls in the oven, lay a chicken cutlet down, top with creamy slaw, and put the lid on the roll! 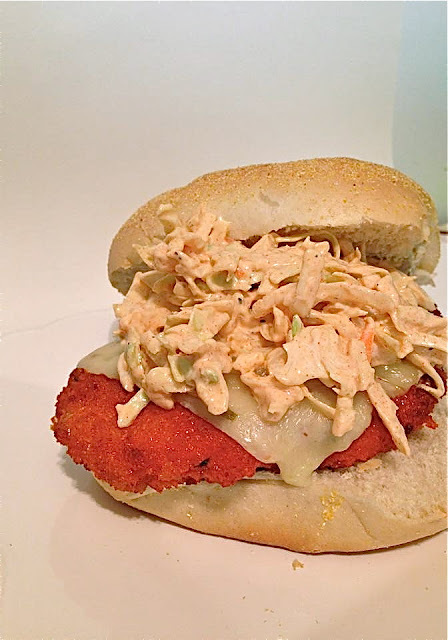 There you have a spicy, vinegary, buttery, crispy chicken sandwich! Enjoy! Mix 8 ounces of cole slaw (purple and green cabbage sliced, shredded carrots, etc. that comes in a prepared bag is fine to use), 4 ounces of sour cream, 2 tbsp. ranch seasoning, and 1/4 cup vinegar together in a large bowl. Add cracked pepper and mix all ingredients until incorporated.